The 4XEM 8 Pin Lightning to 30 Pin Adapter lets you connect Apple iDevices with a Lightning connector to many of your Apple 30-Pin devices. 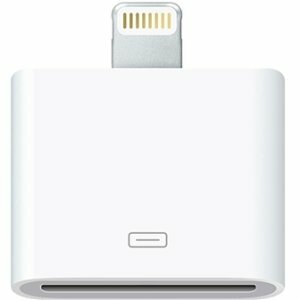 Support for USB audio through iTunes as well as syncing and charging. Analog audio and video output is not supported. Problem it solves: Don't throw those old school 30-Pin accessories out yet - snap on one of these adapters and everything keeps on working with your new 8 Pin Lightning iPhone/iPod/iPad. Marketing Information: The 4XEM 8 Pin Lightning to 30 Pin Adapter lets you connect Apple iDevices with a Lightning connector to many of your Apple 30-Pin devices. Support for USB audio through iTunes as well as syncing and charging. Analog audio and video output is not supported.Problem it solves: Don't throw those old school 30-Pin accessories out yet - snap on one of these adapters and everything keeps on working with your new 8 Pin Lightning iPhone/iPod/iPad. 4XEM gear is respected industry wide for its high performance, premium quality and durability.